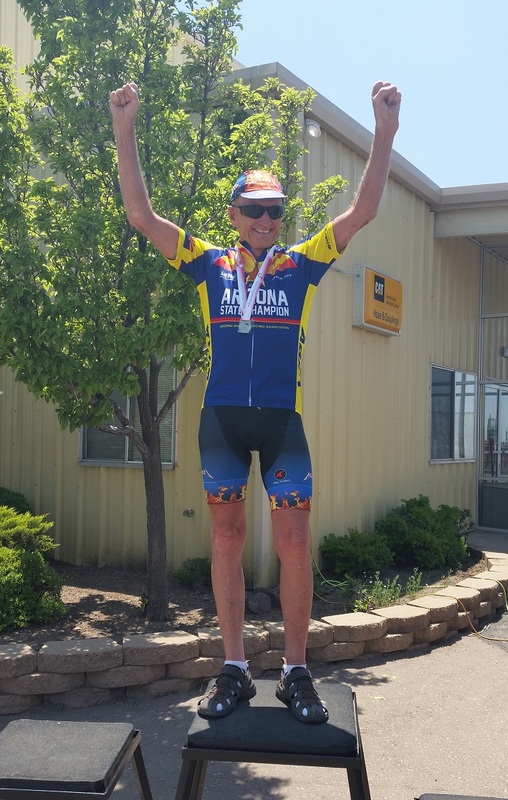 Arizona State Road Race 2015 : Team Aggress! This RR includes a feature I really like; a neutral rollout thru the town of Show Low before the race actually starts. It allows the riders to get comfortable in a position and get rid of the start line stress that may have built up, thus reducing the likelihood of incidents when the race begins. 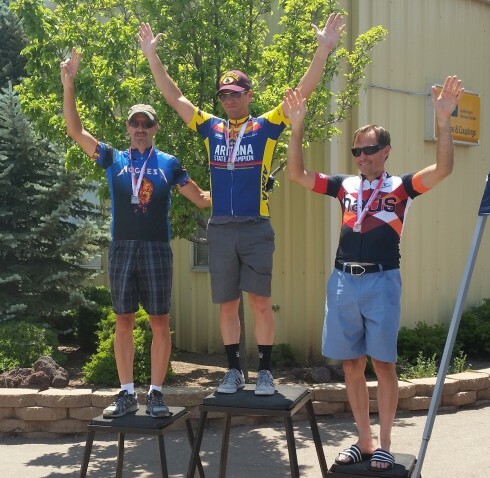 I raced in a combined (60+) field of 22 and had only 2 competitors in my scoring group, neither of whom were known to me. I did memorize their kit during the rollout and at the first modest uphill pitch about 12 miles into the race (Juniper Ridge per Strava) I went off the front of the peloton and set a pretty good pace up the hill. As I summited, I pulled out and took a good look back down the hill at the stretched out peloton and neither of my guys were even visible so I knew my race was in the bag as long as I finished. Of course, I could not just “finish.” By then, I was feeling comfortable riding up front with Reggie, Phil, Dave Burke, and Bixby and decided to make it a good training ride so I made the effort to hang with them on the roller surges from Clay Springs to Pulp Mill Rd. On a couple of those, I had to dig pretty deep to output enough Watts to barely hang. After the turn to the South in Taylor, I went off the front with Dave Burke and we traded pulls up the first hill, only to be re-acquired by Reg, Phil, etc. after summiting. I think we numbered 13-14 at this point and I got gapped a little on both of the modest downhills following that first summit. I was able to re-acquire both times on the uphills that followed. About a mile from the finish where the climb flattens out Reg, Phil, and Bixby began seriously bumping the pace and I tried but in the end had to settle for hanging with the slower guys in that leading dozen. Nevertheless, a satisfying effort and by then I knew I had gotten a good workout. I’ve identified a serious flaw in my racing toolkit that Reggie, in particular, is persistently exploiting. As I summit a hill climb, especially early in a race, Reg will begin hammering the descent as hard, and for as long as he possibly can, and I am barely able to output the Watts to hang. Without hill climbs following several such events in this race, I would have been dropped, for sure.